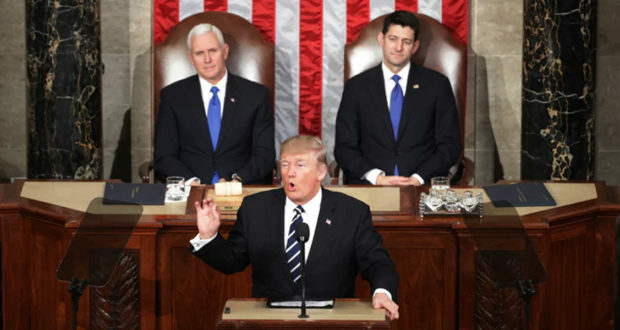 President Trump gave his State of the Union Address tonight before a packed house in Congressional chambers. This was a speech that all Americans could follow and relate to. It is perhaps President Trump’s most “presidential” speech ever, no controversial statements, nothing that could offend. It was peppered with personal stories that lifted the emotional content of the speech very nicely. With the quality of the speech before such a large national audience, I believe his approval rates will go up based on this event. The Democrats were resistant as usual but were apparently advised by Nancy Pelosi not to do anything rude or walk out. They mostly sat and did nothing. Trump first made a summary of the challenges and accomplishments for the year. It was a good opening, what we would term “motherhood and apple pie.” At one point he said “Our country is strong because our people are strong” to great applause. – Some of the tragedies of this year, hurricanes in Houston and Florida, the Las Vegas shooting, fires in California. – The shooting of Congressman Steve Scalese at the Republican softball practice, and thanking the police, and emergency personnel in the process. — Exxon Mobil announced $50B investment in the U.S.
Then President Trump turned to his base and spoke of issues and events that appealed more to Conservatives. MS-13 (the notorious El Salvadoran drug gang infesting America) and other violent illegals, because of loopholes are ending up in the high school with teens. To make sure other families never suffer from this violence, Trump called on Congress to fix immigration to close loopholes that allow in MS-13. 1. A path to citizenship for 1.8 million illegal immigrants who were brought by the parent at a young age. They will have to meet education and work requirements over 12 years. 2. A Fully secure the border, including a “great wall,” more ICE officers, closing loopholes, and ending the practice of catch and release on terrorists. – Blasted North Korea and pledged “maximum pressure” to eliminate the threat of nuclear weapons in the hands of a rogue nation. The optics of the speech could easily counter the rhetoric against Trump that he is uncontrolled and that his remarks can be offensive. The speech was measured, calm, controlled and designed to be all inclusive of Americans. The substance was “substantial” in that it outlined real goals within reach for the next year, and the report reinforced his continuing message that America is improving. The pundits actually found little wrong with the speech. They mentioned he left out any mention of Russia and commented that any impression he left would be destroyed by the next tweet. They said like the “fact checkers” would find many things wrong. One pundit said he expected Trump to go further toward his base. Another said he went to his base too much. In other words, the pundits can’t find anything of substance to criticize. A good speech delivered in Trumpian style. A lot on content but maybe could have been. condensed for time sake. All in all a speech that filled many citizen expectations. What makes it so interesting that finally, in my lifetime, this is a POTUS that states what he is going to do and then does what he says. Quite refreshing. Your comments are spot on. I think it was all of the interruptions of applause that caused the speech to be over an hour long.